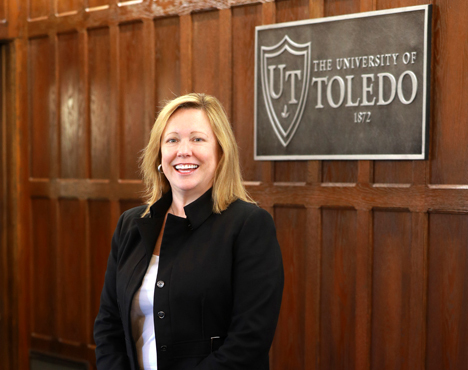 In a strong show of support for The University of Toledo President Sharon L. Gaber’s leadership, the UT Board of Trustees approved Monday an amended contract to continue her presidency for the next five years. The term of the amended contract is from July 1, 2018, through June 30, 2023. Her original contract was set to expire in June 2020. “Dr. Gaber’s leadership has put UT on a positive trajectory toward the ambitious goal of being a top public research university, and the campus is energized because of the great work underway to support our students and the Toledo community,” Board Chair Steven Cavanaugh said. The amended and restated employment agreement updates the president’s base salary and includes specific performance metrics aligned with the University’s strategic plan. The president’s overall compensation is directly tied to achievement of the metrics. The contract extension for Gaber was approved as part of the Board of Trustees’ annual review of the University’s leader in which they praised the positive momentum of the institution. The board commended Gaber’s commitment to student success, noting that student retention rates at UT are the highest in at least 18 years, and the largest number of candidates for degrees in at least 20 years participated in spring commencement. The new Toledo Tuition Guarantee was recognized as a positive initiative to provide more transparency to students and their families. In addition, UT was recognized this year for its value by several external sources. Schools.com ranked UT Ohio’s best four-year college when analyzing criteria such as affordability, flexibility and student services. The website LendEDU also ranked UT the top Ohio public college for the lowest student debt. The trustees specifically noted the improved research portfolio of the institution. The total number of research award dollars is at a five-year high. The board noted that three researchers were named Fellows of the prestigious American Association for the Advancement of Sciences, and several UT students were awarded highly competitive scholarships, including the Goldwater Scholarship and a Sarnoff Fellowship. Also enhancing UT’s reputation is the strong athletics program with two new Mid-American Conference Championships by the football and women’s soccer teams. UT was awarded the Jacoby Trophy as the top women’s athletic program in the MAC and, in the fall, all student-athletes achieved a record high combined GPA of 3.29. Individually, Gaber was named one of the top five higher education leaders to watch. She was appointed to the NCAA Strategic Planning Committee and the Inter-University Council Executive Committee, and serves on the MAC Finance Committee, of which she will be the chair next year. This year the University also received the largest gift in UT’s history from Welltower, which gave UT real estate and a headquarter building valued at $30 million. It will serve as an additional campus where the Division of Advancement will continue to build relationships with alumni and donors. The number of donors to the institution grew by more than 10 percent this year. The increase in philanthropic support and additional initiatives have put UT in a strong financial position, confirmed by the University’s bond rating being reaffirmed by Standard & Poor’s and Moody’s. UT approved this year a new contract with the American Association of University Professors, one of five bargaining agreements approved in the last two years. A new transportation partnership with TARTA will save the University approximately $2 million by not replacing the aging bus fleet while extending free bus rides to students, faculty and staff throughout the community. As part of the performance review, the board voted to give the president a performance incentive per her hiring contract. The funding comes from unrestricted funds that were generated from investment earnings and allocated to a Board of Trustees account with the UT Foundation. This entry was posted on Monday, June 18th, 2018 at 2:09 pm and is filed under Advancement, Alumni, News, UToday .